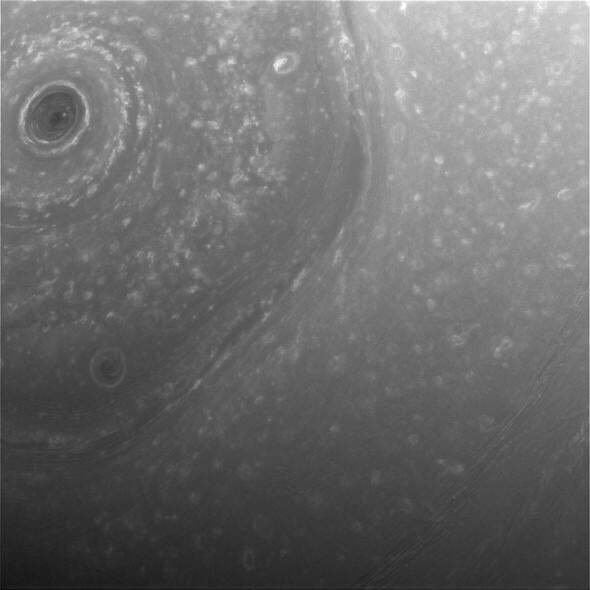 Cassini images of polar hexagon as mission nears end. Storms at the north pole of Saturn pop into view as Cassini passed over them. The new orbits started on Nov. 30, and a few days later Cassini passed over Saturn’s pole. The image above, taken on Dec. 3, shows amazing and lovely detail there. The dark oval is a storm over 2000 kilometers across—if it were placed over the U.S. it would stretch from California nearly to Missouri! You can also see three sides of the famous hexagonal weather pattern, too, each eerily straight and connected by a soft vertex. This is a natural outcome of winds blowing on a spinning planet; we see such patterns (called Rossby waves) on other planets and even on Earth. The entire hexagon is a staggering 20,000 km across! Each side of it is about the same size as Earth itself. 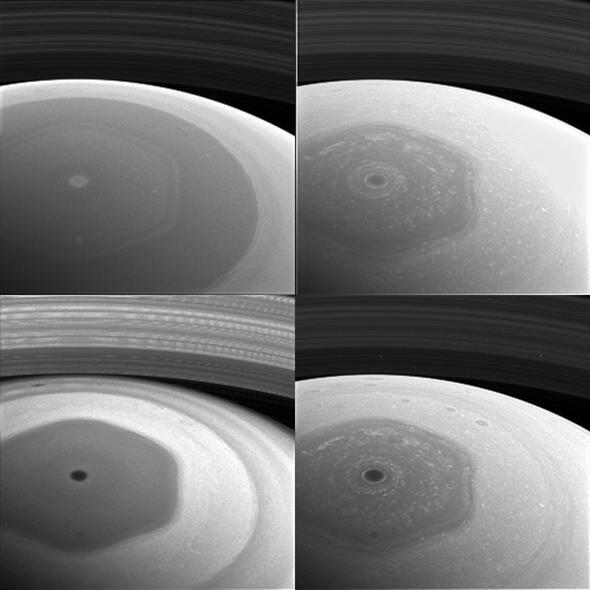 Four views of Saturn’s north pole using four different filters: violet (upper left), red (upper right), near infrared (lower right), infrared (lower left). This collage shows four images of Saturn’s pole taken using different filters. Each shows different aspects of the clouds. For example, the upper left image shows violet light. That color is easily absorbed by clouds, so what you’re seeing there is just the cloud tops. Saturn has haze above its clouds, but redder light can penetrate it, so the upper-right shot, taken using a red filter, shows more details in the clouds. The lower-right image was taken in the near infrared (at 728 nanometers if you’re curious), outside what our eyes can see, and shows the location of methane gas. Finally, the lower left shot is in the infrared proper (938 nm), where methane is transparent so we see even deeper into the clouds. All of these images can be used by planetary scientists to better understand what Saturn’s complex atmosphere is doing. How does the temperature and wind speed change with height? What about the chemical composition, and how the winds interact? By studying the planet using different filters, we learn more about what makes Saturn tick. And the more we learn about that, the more we can know about our own planet, how it’s similar to Saturn (like our jet stream flow) and how it differs. Cassini flew past Saturn’s rings again just Sunday and hopefully we’ll see that data soon. There will be a total of 20 such orbits, each taking a week. In April, Cassini will make a close flyby of Saturn’s enormous moon Titan, and engineers have designed the trajectory to utilize Titan’s gravity to change the spacecraft’s path, sending it on the riskiest maneuver yet: It will plunge in between Saturn itself and the inner rings, just a couple of thousand kilometers above the cloud tops! Then there will be one final event. After 22 such short orbits, Cassini will plunge into the planet’s atmosphere, burning up. That will ensure it doesn’t crash into the moons, possibly contaminating them, and will also give us a last few bits of data on Saturn’s upper atmosphere. Even in its last seconds Cassini will continue to do its job, as it has so dutifully these past 12 years. While bittersweet, it will be a fitting end to this amazing mission. But there’s still much to do between now and then, and much for this intrepid machine to see.